When I wrote this post a year ago, I hadn’t gotten my act together to try out the home-cured corned beef recipe. I STILL haven’t tried it, technically; but I did purchase the brisket today and will be settling it into its cure tomorrow. When I remarked about this development at the RRG Facebook page, people asked for the corned beef recipe, so I’m posting it here, where it really belonged in the first place. The corned beef method is not mine; it crossed my radar originally as part of a Farmer’s market newsletter a few seasons ago. It’s the brainchild of the family that runs Watson Farm in Jamestown, RI. Their Conimicut grass-fed beef and lamb are exceptional, I can solemnly attest; so I have no reason to think that they’d spoil such a lovely product with a lousy corned beef cure. This is their annual go-to recipe for corning a beef brisket, no nitrates, nitrites, preservatives, or artificial anything required. In large sauce pan or small stock pot, bring to boil the water, spice mix and salt. Remove from heat and allow to cool completely. Place brisket in a two gallon zip bag and pour corning brine over brisket. Seal bag, removing as much air as possible. Place bag in a large dish and weight down brisket so that it is completely submerged in brine. Refrigerate for five days. Rinse under cold water before cooking. We had our St. Patrick’s Day dinner a bit early, but with two good reasons: 1) Tuesday nights, as anyone who follows my meal plans knows by now, are dedicated to the slow cooker; and 2) I have a small, generally unfulfilled love affair with corned beef hash, and I wanted leftovers available so that I could make it before the week was through. Hence, last night was the “traditional” St. Patrick’s Day supper of corned beef and cabbage — which, in my humble opinion, is at its best when slow-cooked. I know corned beef is not a particularly healthy item. We generally try to stay away from processed meats, with the rare exception; but this IS a rare exception. 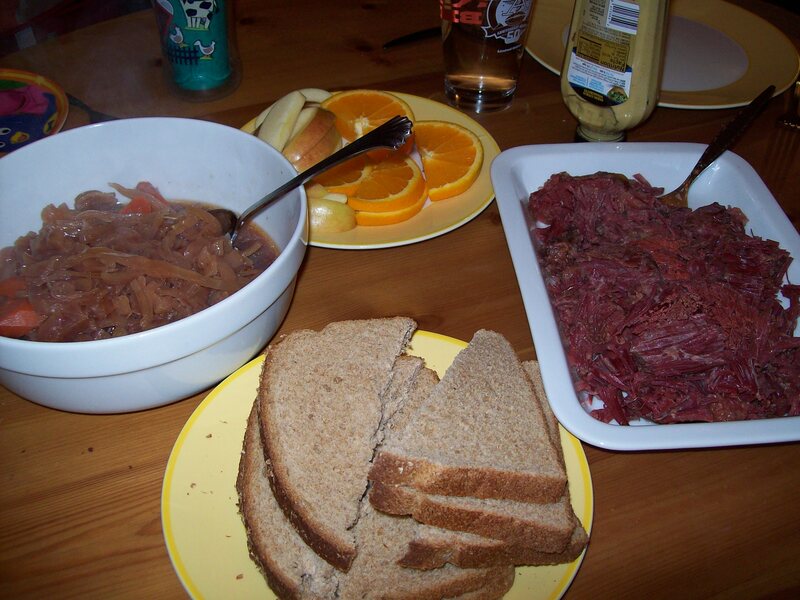 I mean, honestly, corned beef will show up once or twice in a whole year on our menus, and then be forgotten again until the following March, when all the shamrocks and false claims of Irish heritage remind me that it’s time for a big hunk of salted, strangely pink, deeply appealing meat. This year, I was really planning to cure it myself, thus eliminating the health concerns and processing — a good-looking recipe has made the rounds of the winter Farmer’s Markets here in RI, and for a couple of seasons now I’ve pondered it, but have always been daunted. This, I promised myself, would be the year. Um. Did you know it takes five days to home-cure a corned beef? Yeah…I DID know that, at some point, but I just sort of pushed it to the back of my mind and thus didn’t pick up the necessary brisket from the butcher shop in time to pull off this particular feat of homespun cookery. I vow that someday, I will be super on-top of things, and I will in fact try the home-corned beef method, but today is not that day. Besides, I hate to bring this up — since generally I’m all for finding the balance between sticking to a budget and making choices to invest in better quality foods as an investment in your family’s health — but a nice brisket would have been significantly more expensive than the frighteningly dirt-cheap cryovacked thing J. brought home from the neighborhood grocery store. I’ve done slow-cooker corned beef a few different ways, and usually, I pour in a generous slug of some kind of Irish ale — Guinness, Bass, or the like. However, I wondered this year if I could do an alcohol-free preparation that would be as satisfying as the previous experiments. It turns out that simple things really are best, because I managed to come up with a pretty tasty meal that required extremely minimal prep time, yielded a TON of leftovers for hash-making (mwah ha ha…mental rubbing of hands), and was completely without fuss when we walked in the door last night with two starving and dangerously tired kids. Nothing else to make, nothing else to do, but slice up some fruit, plate some bread, and dish up the St. Patrick’s Day love. 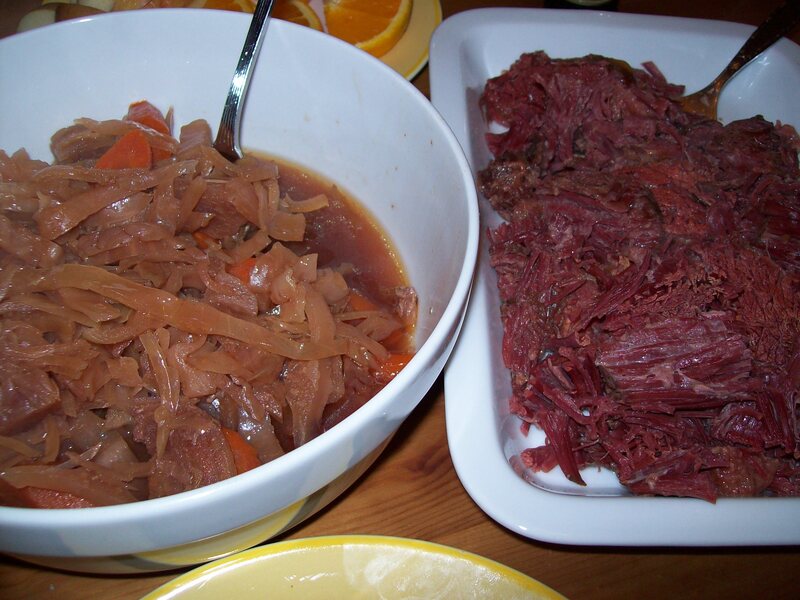 Although I don’t ordinarily share recipes directly within a post, I’m displaying this one right here — after all, it is St. Patrick’s Eve, so to speak, and somebody might desperately need a way to cook their corned beef tomorrow. Happy wearing of the green, everybody, and stay tuned — if the hash turns out right I’ll be sharing that one too. Place the corned beef in the bottom of the slow cooker and sprinkle all over with the seasonings (pepper through bay leaves). Cover the meat with the carrots, onion, and cabbage. Pour the cider vinegar and chicken stock over the top. Cover and cook on LOW 8-10 hours; serve with bread and butter and a good quality brown mustard on the side. This entry was posted in Cooking, Meal planning, Slow cooker and tagged cooking, family, feeding kids, food, holidays, Household organization, leftovers, meal planning, recipes. Bookmark the permalink. Happy St. Patrick’s Day! Sounds like a great recipe…lucky for me as I’m the vegetarian in the house I only have to worry about the veggie dishes! Oh, veggie recipes for St. Patrick’s Day could be so fun! Mmmm…colcannon…braised cabbage with spicy mustard…lots of greens…you’re making me hungry! Let’s hope I can pull it all off…I’m not much of a cook…but colcannon, carrots and parsnips, a salad, and some soda bread seem within my realm! You’ll do great! And it sounds fabulous. Enjoy your veggie feast — it’ll be a lot healthier than our hash!